Every notice some of your veins are more enlarged than others? These could be a varicose vein, which show up as gnarled and very large looking. Any vein in your body has the ability to become varicose or spider, a mild variation of varicose veins. Most of the time, varicose veins are just a nuisance more than a health concern. They sometimes cause pain or discomfort, though not often, and may be a sign for a higher risk of other circulatory problems. However, most of the time, the biggest concern for people with varicose or spider veins are simply how they look. Varicose and spider veins most often show up on the legs and feet, and may be dark purple or blue in color. One of the biggest problems when it comes to making varicose veins worse is blood pooling. So every day or so, massage your legs, or wherever the veins are located, with gentle, upward stokes, which can help smoothen and lessen the twisted veins and help with blood flow. Avoid putting pressure on the actual veins. You may want to use oil or aromatherapy oils for the ultimate in relaxation. Try using compression stockings, which can help end varicose veins by eliminating elasticity of the blood vessels. You can the stockings to feel gentle, but still consistent with pressure as it compresses the veins and lessens its diameter. You should be able to find compression stockings at most department stores or online. Garlic contains a compound called allicin, which can help prevent blood vessels from becoming inflamed. Add this savory deliciousness to your dinner every night, and you might be surprised with how your veins look a little better. You can also try a mixture of garlic, orange juice, and olive oil and applying that to the affected areas. This combo is said to strengthen the blood vessels and improve blood circulation. Known for its anti-inflammatory abilities, apple cider vinegar can help reduce swelling and increase blood flow around the affected areas of the veins. Take a tablespoon of the vinegar every day (you can dilute it with water, if you desire) or apply it to your skin and gently massage it into the area. While the heart pumps blood into the arteries, its return to the heart from the legs is supported by moving your calf muscles. That means standing and sitting for long periods of time can make things worse for your veins. You don’t need to engage in a a rigorous exercise routine—walking might be just enough to help with circulation. This is especially important for people who have desk jobs and are sitting most of the day; try to take a break and get outside for a stroll if you can (and if not, definitely try standing up and taking frequent stretches at your desk!). These are said to greatly reduce inflammation and appearance of your skin. You apply these on wet, and as it dries, it contracts, resulting in a tightening effect. You can also try clay, which can detoxify impurities from the skin and the blood vessels and reduce the appearance of your veins. It sounds a little Halloween-y, but hear us out. A Native American herbal remedy, witch hazel has helped many people find relief from their varicose veins. The extract contains tannins that helps in constricting the varicose or spider veins and restores their natural elastic nature. It’s also known to be a great anti-inflammatory as well. 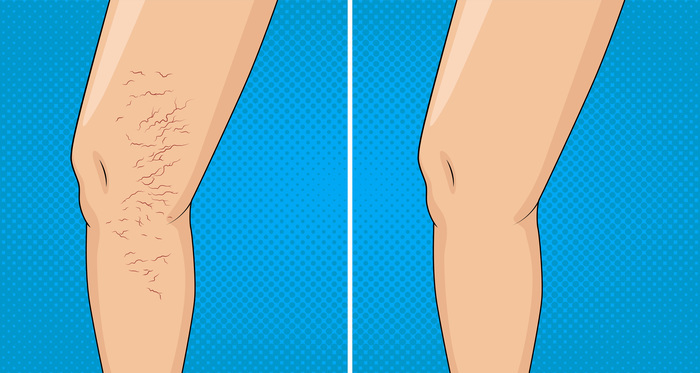 Do you suffer from varicose or spider veins? How do you find relief?